Horse owners are bombarded with various medications and chemicals for sick horses. When it comes to allergies and itching in horses, chemical solutions can be very toxic and often don’t provide a long term solution. Homeopathy from Heal with Ease is an alternative. People often believe that itches, rashes and allergic reactions need to be eradicated quickly. In fact, allergic symptoms and itch are signs of dis-ease in the body. To lift the external symptoms, internal unbalance needs to be addressed. This is where homeopathy can help. In the case of allergies, the body is usually overloaded with toxins. Any extra load from, for example, mosquito bites, extra chemicals or seasonal grasses may result in allergic reactions. It is not that the horse is allergic to insects, chemicals or grass. Itchy skin in horses, such as QLD Itch is most often caused by toxins releasing through the skin. The toxin is usually acid which causes the skin to itch. 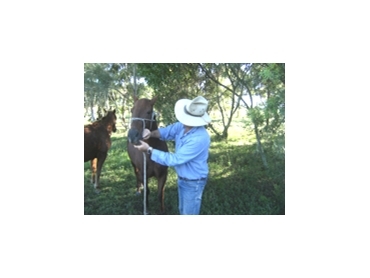 The horse scratches and damages its skin and mites may be attracted to the skin. Detoxing is the first step in clearing up horse allergies. Then a natural homeopathic product should be used to lift out mites and heal the skin. Homeopathy is a quick natural treatment for horse allergies.